How do you choose between two icons? We agree, it’s a tough choice! The Rolex Daytona and the Omega Speedmaster have both made big impacts in the world of chronographs, either would be a fine piece to add to any collection. Both models are major players for their brands and have spent decades making waves in the luxury watch world. The two models have many similarities, but some important differences. Notably, the Omega Speedmaster is slightly cheaper, the Rolex Daytona carries a hefty price tag but that’s usually not make or break for most luxury watch buyers. The right decision depends on your personal aesthetic and what you want to get from your watch. The Rolex Daytona is certainly higher in price, but that comes with increased prestige and recognition. Rolex as a company is recognized worldwide for their watches, even among those who know little about chronographs. We all like to think that we do things just for ourselves, that we don’t care what other people think. But, when it comes down to it, most of us do care, don’t we? For that reason alone, Rolex can be a good choice if you want to get noticed since more people recognize the brand. The Daytona came on the market in 1963. Named after the city of Daytona, Florida, the home of the famous Daytona 500 car race, this model is synonymous with racing. It was endorsed by the racecar driver Paul Newman, which greatly contributed to its initial popularity, and it is seen as a racing watch. The Rolex Daytona’s appearance varies, as there are models available in both steel (pictured above) and gold as well as platinum. There is also a model available that features both steel and gold. It has a 40mm case and is especially well suited to casual or semi-formal wear. One notable aspect of the Daytona is its accuracy. It, like every Rolex, carries the Superlative Chronometer designation. That signifies it is accurate to -2/+2 seconds a day, double the accuracy required of most chronometers. The power reserve is an excellent 72 hours. On the whole, the Rolex Daytona is an excellent watch for racing enthusiasts and for anyone looking for a classic watch with a high degree of accuracy. The major drawback to the watch is its price, although it’s worth noting that they often fetch a good resale value, sometimes even appreciating rather than depreciating. The Speedmaster first made its way to the market in 1957. It was considered the official timekeeper for the Olympics, and it was one of the few chronographs that could be worn on the wrist at that time. Since then, some of its greatest fame has come from the fact that it was the official watch of the American space program and was the watch of the astronauts during the 1969 expedition to the moon, as well as during other manned space travel. It has remained popular as a stylish option for the watch collector, or even a tempting entrance to the world of chronographs. The Omega Speedmaster is slightly less accurate than the Rolex. It is accurate to -4/+6 seconds per day compared to the Rolex’s -2/+2 seconds. However, this is still a good amount of accuracy and fine for the average wearer. The Omega Speedmaster is easy to read and available in stainless steel, with fewer options than the Rolex regarding appearance. It is a classic sports watch with a great history. 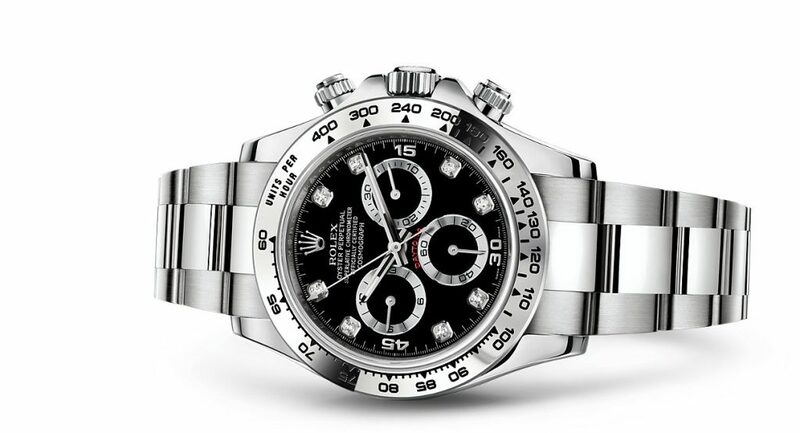 The Rolex Daytona starts at about £7500 / $10,000 in our store. We offer the Omega Speedmaster beginning around £1300 / $1800. The right choice will depend on the amount that you are looking to invest, as well as your goals for aesthetic and performance. Both are solid choices that would be a strong addition to any collection.